It also indicates it's probably a good time to start some more serious efforts to make sure the stats are balanced, so we can smooth out the experience by avoiding any useless stats or stats that are so massively OP that they make other stats feel useless by comparison. Also, it's good to iron out problems like the MkXI variant of a part not having really any better stats than a MkI variant of the same part, but it costs a ton more power. 1) By "Level" it means to the level of an effect on a part. If you want to see the level of an effect in the game, press F3 to turn on debug-output, and then mouseover a part (in that order, toggling F3 on while already moused-over won't change what's displayed). -- note for the curious: Every effect on every part in the game has a level from 1 to 25 (which fully determines the effect's actual numeric value), and when a part is generated it "spends" its item levels on the effects specified by its type, variant, prefix, and suffix. 2) The other names in the top row correspond to the different effects you can find on parts in the game. 3) The value directly under an effect name is the numeric value it has at level 1. The one below that is the value it has at level 2, and so on. 4) If a cell says "-1" that means "there's no value for this level, check the next lowest level". This is for stuff like sensors that are whole numbers but can't go up by 1 point per level without being way OP. So if it wanted to give you a level 4 sensor effect it wouldn't, it would slide down and give you a level 1 sensor effect (and only charge the item 1 level for it, incidentally). 5) These stats are from my working copy during the development of 0.913, not from the currently-public 0.912. I've patched up a number of issues with the values since 0.912, as detailed in the 0.913 patch notes. 6) It's a bit of a mess in 0.912, but in 0.913 onward feel free to look at your own copy of BalanceInfo_ModuleEffectType.csv in your RuntimeData directory; it's re-written every time you start the Bionic.exe application (by the time you get to the main menu, at least). The table in this post is just a slightly adapted version of that. 7) If none of this makes any sense, that's ok Ask questions if you want to, or just shake your head in pity of the nerdy programmer. Wow! Most other games that have this information available, if it's available at all, got it from enthusiastic players reverse engineering the results and memory by hand. It's really awesome that you guys put it all out there for the world to see! But this is an alpha, and the point is to get feedback and iterate on it. To get effective feedback on parts stats, at least some of you have to see the innards. hmm... I'm not good with math and such, so any input I give here is going to be purely from in-game experience rather than tables and formulas, which is generally how I always do things. Also, this is all based on experience in Expert mode. That being said, so far, alot of the stats and such seem balanced enough. There's still a few that are funky though. Regen might be a bit too strong right now. My assault Exo is nigh-invincible half the time against all but the strongest bots, with a full 79 regen. And it's not like I actually focused on regen.... it just came about as a side effect of adding other parts. It's not uncommon for his health bar to be in the yellow and yet still jump back up to 100%. On Expert. System protection is not very useful, and in this upcoming version it looks like it's going to become entirely worthless. This effect simply doesnt happen much, and if it only comes from bosses, which are very rare enemy types, it's very likely that the player will simply never encounter it, period. So it ends up being almost a liability, since it ends up taking up a spot where some other stat could have been added instead. Damage reduction; too weak to be of much use. I'm thinking this is likely the case even on the lower difficulties, as most damage reduction numbers tend to be very small with not that many parts having that stat often at all. This one feels like it doesnt scale well. Even weak bots put out alot of damage compared to what the numbers for this stat end up being. AoE boosts, the biggest problem with these is that it often feels like any part that has this stat is a part that's barely doing anything, as you need quite a percentage to see an actual increase in the AoE size. It's also super-dependant on your team composition. If you have the Siege Exo, this can be of use. If you dont, then it's tmostly useless. And finally, power use, it seems like this scales up quite a bit slower now than it was before. I havent had to do all that much with reactors yet and havent even had the need at all for auxiliary types, or those other gizmos that can boost power from multiple locations. And I'll attach the part log file thing. Anyway, below is a table of all the stats that can go on parts (other than the reduce-power-cost-of-all-parts-in-this-system one, which I'm unsure will remain in the game, just seems too indirect and so forth). FWIW, I use that stat. It's pretty handy if you get it on something that also has exo-wide boosts, if you can put that something into a system you don't want to spend a lot of power on (like the pistol on the science exo). I've gotten the power cost for items down really low and still been able to slot stuff that otherwise I wouldn't have had the power for. Another issue with removing it is that there just isn't a huge number of stats & effects right now, if you lower the number of them too far every item is going to look the same. FWIW, I use that stat. I've used it too, and like the general idea of it. It's a bit like those stats in Torchlight 2 that give you a reduction to the level requirement costs for a certain type of weapon/armor. That stat is useful.... just not in the early part of the game. Later on, it can become important. Ok, here's a question for all. What's the general opinion on rarity (presumably the colour border represents this)? Generally in other games if you find an item of high rarity then it it usually signifies that this is a quality piece of kit and will almost always be better than another item of similar level. In this game I'm not sure. I think this may be because I don't fully understand the stats yet, so what looks not-so-good is actually better than I think, but I'll continue. In a nutshell, I haven't yet had an experience in this game where a rare piece of loot has been found and I've thought "oh....yeah.....(drools) fetch me a towel" (simpsons quote). For example, in Torchlight 2 I used to have a really low level pistol, but it was such a quality item (gold rarity) that it performed well for maybe 20 levels ahead of where it should have. I want more stuff like this in BD, some gold rarity low level (Mk2..?) computer chip with super low power requirements that I can plug in and 20 missions later retire to my archive saying "you've served me well Goldy". You get the gist. I think some of the stats may not be scaling quite right. Like, you often see the parts that give you 6% to some stat group, and you can find such a part within the first couple days.... and 15 days later, you'll be finding parts, purple ones, that are just 7% instead of 6%....not much of an increase. There's other stats that seem to have this issue as well, which I think is what can cause some of the "legendary" parts to be underwhelming at times. Yeah it depends on the stat, I think. Some other cases you'll find the stars align and a legendary is awesome. Emma's special ability is good for that because they appear in the shop, so you see a LOT of them over the course of the game. I'll play as Emma next time. See if I can find anything cool. Thanks for the tip. 1. You get shot for small amounts of damage by a single bot. Reduction will stop 15 damage. Regen will heal over double that, and will do it five times. If you're being shot for 20 by this bot, regen wins. If you're being shot for 30, regen wins easily. If you're shot two turns in a row, regen REALY wins (total of 30 reduction and 30 damage taken, vs 60 damage taken and 60 damage regenerated, or 0 net). 2. You're being shot for large amounts of damage by a single bot (say 100). Reduction lowers it to 85. If you kill that bot, regen will fully recover it before the regen window ends. If you get shot two turns in a row, reduction will lower the damage by 30, and regen will recover 185. Not even close. 3. You're being shot for one-shot kill levels of damage. Regen is useless. Reduction might save you, if you can get enough of it. This is pretty rare on Easy/Normal, I haven't played higher difficulties yet. 4. You're being shot by multiple bots at once. If these are doing large damage, you're probably dead. So lets take a more modest damage number like 30. - Two bots: Reduction will drop the damage to 30 a turn. Regen will recover a bit more than half of it (31) a turn. Regen wins. - Three bots: Reduction will drop the damage to 45 a turn, lowering it by 45. Regen will recover less than half (31 a turn). The problem is that you're probably not going to keep getting shot by 3 bots (unless you're doing something wrong), which means that next turn you're taking less (or no) damage, and thus regen will simply repair what you took from this. So unless you just stand in the open taking these shots, regen still wins. - Four bots: Reduction will drop the damage to 60 a turn. Regen will recover around 1/4 of what you're taking, meaning you're taking a beating. It'll take three more turns to undo all the damage. IF you get out of fire, regen still wins. - Four bots, two turns of being shot: Reduction will drop the damage to 120 (blocking 120). Regen will recover 31 for six turns (as you were shot over two turns), recovering 186. Assuming you survived the barrage, regen STILL wins. What I'm seeing here is that damage reduction is strictly worse than regen in every case except where it happens to block just enough to make you not die, which in my experience was pretty rare (if two Wyvernbots are in range, you're a lot better off using stealth than hoping your damage reduction can save you). The regen numbers should come down to reflect that it can work over five turns unlike reductin's immediate effect. Hmm. How much is his max health in a case like that? If you have 79 regen that should be a max of 395 healed over 5 turns from a single shot. Any other shots taken would shorten the time available to heal the first shot. I'm just trying to see if there's a bug where it's allowing you to heal damage way older than it should. System protection is not very useful, and in this upcoming version it looks like it's going to become entirely worthless. True, but in this upcoming version it also says "Removed the System Hardener part type and the System-Damage-Resistance stat" Which is why it isn't listed in the above table, either. Hmm, ok. Bear in mind that this applies to every incoming shot, and is thus kind of the opposite of Regen (which really only works with full efficiency on one, maybe two shots in a "batch"). That said, what kind of values would make this strong enough to be of decent use? One of the changes already in for 0.913 (and represented in the above table) is that now the stat starts at 25% rather than starting at like 4%. It's still very much siege-oriented but I don't necessarily see a problem with that. The other aoe weapons should still benefit from it with two parts, or one part by mid-game. It may be that the base aoe's are too small for some of the weapons, we'll see. A ha! Many thanks for the log, that's very helpful. What happened here is that the part got both a +shields prefix and +shields suffix, and this reveals a bug in how I'm handling the math on prefix/suffix stuff on those (applying a multiplier I shouldn't be). Should be relatively straightforward to fix (famous last words). On everyone chiming in on the reduce-power-consumption-of-all-parts-in-this-system stat: thanks, it's helpful feedback to know that the stat actually matters I'm not looking to just cut tons of stats (there's one more that's going to get combined into another shortly, none others planned for the chopping block) but I didn't want to leave in any ones that really weren't carrying their weight. Anyway, on that reduction stat: any point in making it apply to all parts in the exo instead of just the parts in that system? The high-end of the numbers probably needs to come down for that to not be OP, dunno. Or is it just more interesting as a system-specific stat? I ask partly because it's the last system-specific stat left that isn't on a weapon (which has attack, range, splash, and ammo), and the UI is a lot easier to understand without system-specific stats. But just the one isn't too bad, and is already handled decently iirc. A MkII common gets 4 item levels, a MkIII gets 5 item levels, etc. But power consumption is based off the mark level. 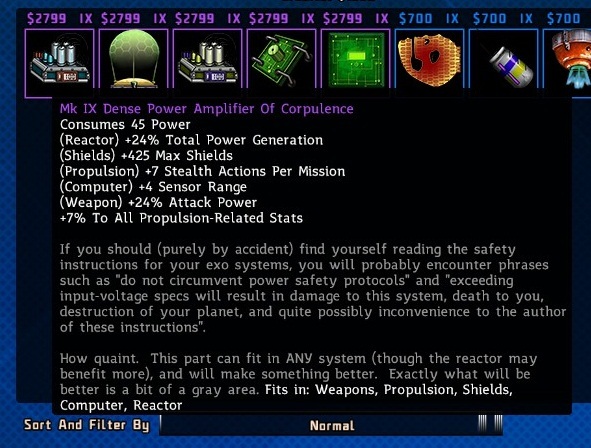 Anyway, that means that a MkI legendary part is as good as a MkVIII common part in terms of stats, with mark-one power consumption. And of course, if the part has additional stats from a variant type or prefixes/suffixes (and legendary always has prefix/suffix) that dilutes the actual item level over multiple stats, so it's not like Meg could find a MkI orange with +400 shields once I fix those bugs... unless of course it rolls +shields on both prefix and suffix, heh. 1) For your exo, it remembers 5 numbers. They start at zero. - Regen does not work at all if you are taking damage every turn. - If you are taking damage from multiple shots in a short timeframe, the time to regen those hits is pretty small. If you're taking damage from 5 units at once the first one's damage is un-regenable immediately (or maybe it's 6 units). Though I guess you're kind of dead in that case anyway. In both of those cases damage reduction is chipping in immediately and against every shot. a) There's probably some bugs allowing regen to work while you're still taking damage. b) Or there's some bugs allowing regen to work on damage older than it's supposed to. c) Or the numbers are just really out of balance, and need tweaking.